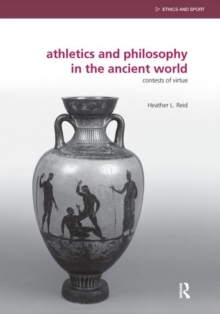 This book examines the relationship between athletics and philosophy in ancient Greece and Rome focused on the connection between athleticism and virtue. It begins by observing that the link between athleticism and virtue is older than sport, reaching back to the athletic feats of kings and pharaohs in early Egypt and Mesopotamia. It then traces the role of athletics and the Olympic Games in transforming the idea of aristocracy as something acquired by birth to something that can be trained. This idea of training virtue through the techniques and practice of athletics is examined in relation to Socrates, Plato, and Aristotle. Then Roman spectacles such as chariot racing and gladiator games are studied in light of the philosophy of Lucretius, Seneca, and Marcus Aurelius. The concluding chapter connects the book's ancient observations with contemporary issues such as the use of athletes as role models, the relationship between money and corruption, the relative worth of participation and spectatorship, and the role of females in sport. The author argues that there is a strong link between sport and philosophy in the ancient world, calling them offspring of common parents: concern about virtue and the spirit of free enquiry. This book was previously published as a special issue of the Ethics and Sport.